Celebrate volunteers, share a potluck dinner, and enjoy feature presentation by Tom Shimko, "The Great Divide". Please join us for an evening of fun, camaraderie, and festivities as we celebrate the accomplishments and contributions of our fellow Tacoma Mountaineers! This year’s Tacoma Branch Awards Banquet will be held on Friday, Dec 7, at the Tacoma Mountaineers Program Center. We’ll be honoring some of our most dedicated volunteers, awarding Peak Pins, and enjoying a special presentation by Tacoma Mountaineer Tom Shimko on his epic mountain bike ride of The Great Divide. The Tacoma Branch Council will be supplying a main course of lasagna (regular and gluten-free options), and we ask that attendees bring a dish to share. If your last name begins with letter A – N, please bring a side dish or salad. If your last name begins with letter O – Z, please bring a dessert. Beverages are BYOB. At 2,700 miles, the Great Divide Mountain Bike Route is the longest unpaved mountain bike route in the world. Largely following county, Forest Service, BLM and Canadian provincial gravel roads of varying quality, the route crisscrosses the Continental Divide with miles of spectacular terrain and scenery, dirt road and mountain pass riding every day. This past late summer and early fall, Tacoma Mountaineers Tom Shimko and Becky Myrvold embarked on their journey southward from Banff, Alberta. Full disclosure: they admit they did not complete the full route to the Mexican border, finishing after only just under 2,400 miles, in Albuquerque, New Mexico. Come enjoy their stories and see a slice of a remote part of North America. 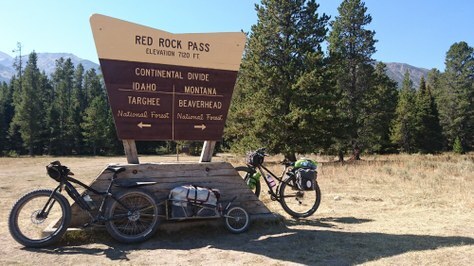 Tom and Becky both have a long resume of backcountry adventuring, but this was their first bike-packing trip. Humor, grit, and a continued sense of adventure kept the novice bikers pedaling.